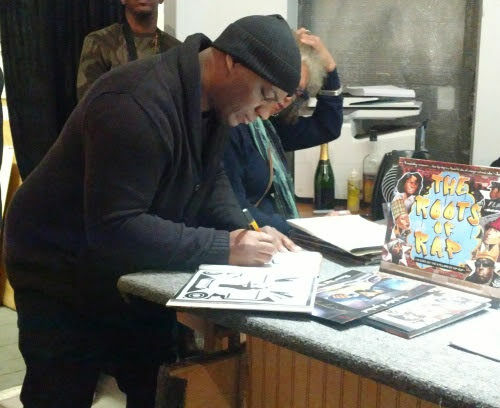 If your family are fans of hip-hop music and culture, then you'll enjoy "THE ROOTS OF RAP: 16 Bars on the 4 Pillars of Hip-Hop" by award-winning children’s book author Carole Boston Weatherford and illustrator Frank Morrison. 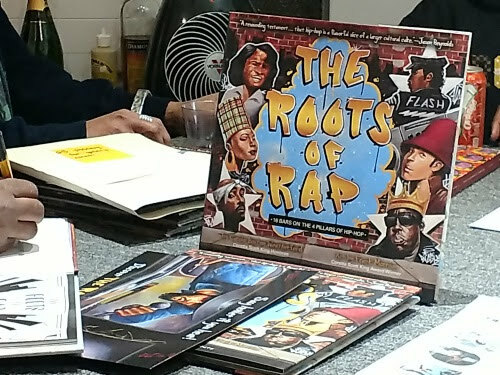 Note: I was invited as media and received The Roots Rap book for review purposes. Views expressed are always 100% my own. In "The Roots of Rap: 16 Bars on the 4 Pillars of Hip-Hop" ($18.99 US / $25.99 CAN), readers will learn how rap evolved from folktales, spirituals, and poetry, to the showmanship of James Brown, to the culture of graffiti art and break dancing, making way for the musical artists we know today. 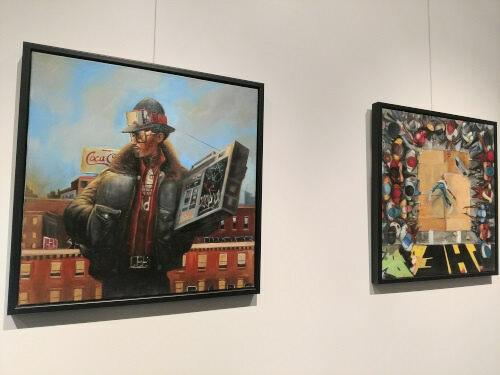 To celebrate the launch of the book, a press event was hosted at the Richard Beavers Gallery. During the event I met with author Carole Boston Weatherford and illustrator Frank Morrison to learn more about the book. 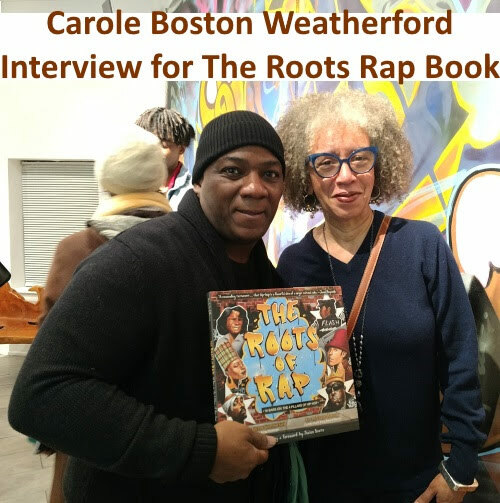 What made you come up with the idea for "The Roots of Rap"
Carole Boston Weatherford: Generally I write something a couple of years before it's published. So I conceived the idea for this over 10 years ago and began writing drafts of the project. It just took some time to find a publisher. At that time, I thought hip-hop had been around 30 years and I thought it was worthy of being studied and chronicled. I wanted youths to have a book that would kinda chronicle the history of hip-hop. That's why I wrote it. I thought it was important enough in our community, our culture and in global youth culture, that youth needed to know the history of it. What message do you want families to get after reading "The Roots of Rap"
Carole Boston Weatherford: I would like for families to read this book together, so that parents can share their perspective about what hip hop was, when they were growing up, and pass down their knowledge and love of hip-hop to their kids. I'd like for kids to understand that hip-hop grew out of African American culture, spoken word traditions and storytelling within families. So many things in families get passed down by word of mouth. The history of the family. I want them to understand that hip-hop is part of the rich oral tradition within the African American community. 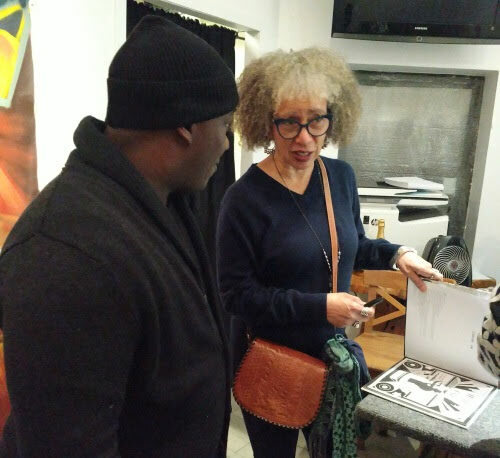 Carole Boston Weatherford: Hip-hop is the language of global youth culture. Although hip hop is born in the Bronx, Harlem and Brooklyn, the originators have now given it to the world. So hip-hop is spoken all around the world. Yes it still belongs to us but it's our gift to the world. And it's a vehicle for expression among youth all over the world. And it's democratic. You don't need anything to create it. I'm talking about free-styling. You don't need anything other then a mind and a gift for rhythms. You don't need a degree. You don't need a whole lot of equipment. Even that is democratic now, cause you can do it on your phone. Carole Boston Weatherford: That's why it's so attractive to youth. So I want youth to understand that hip-hop is literature. If you can write hip-hop, you can write other things also. Your stories are valid. You can tell them through hip-hop, through other genres of of literature. Hip-hop is valuable, it's part of culture and definitely here to stay. After our interview, Carole and Frank greeted guests and signed books that were being sold at the gallery. The roots of rap and the history of hip-hop have origins that precede DJ Kool Herc and Grandmaster Flash. Written in lyrical rhythm and brought to life with breathtaking illustrations, this book will introduce rap to a whole new generation and bring long-time fans back to their roots. The book also features a foreword by Swizz Beatz, a Grammy Award winning American hip-hop rapper, DJ, and record producer. 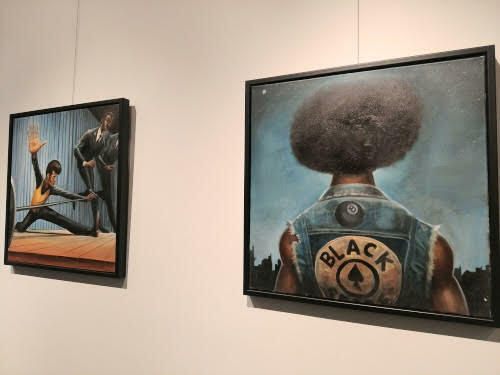 Meanwhile I took a moment to check out some of the original art by Frank Morrison from The Roots of Rap will be on display. It was amazing to see the artwork of the book in it's original form. You can see all the detail in each picture, which really makes you appreciate each scene in the book. 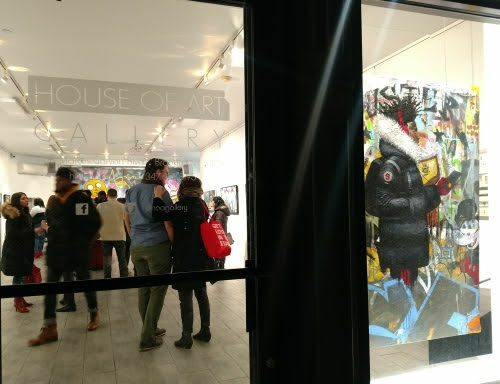 If your in the Brooklyn area, stop by the gallery and see the artwork for yourself. 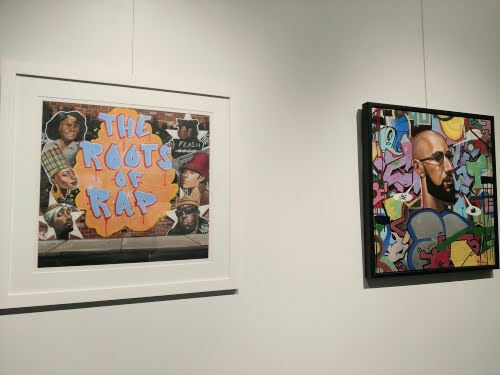 The Richard Beavers Gallery will have "The Roots of Rap" open to the public till January 20th.